The mirror does not turn on when you look at it - it turns on when you are within distance. Are you in need of a good make-up mirror? Are you wanting to see every wrinkle, hair and dark shadow to be sure they are covered with makeup to perfection to get that flawless glow you’ve always wanted? Are you trying to figure out which mirror has the right features for you? Then be sure to check out these top-rated makeup mirrors to hear what other consumers have to say in order to pick out just the right product for your needs. This gold standard, simplehuman Sensor makeup mirror runs a whopping list price of $199.99. The price tag may seem high, but is it worth it? Are you a fashionista looking to impress with your flawless look? Then you may want to check out this #1 pick to see what it has to offer. What are the perks of owning this simplehuman mirror? The description boasts a wireless feature that allows this mirror to be moved easily. It also lasts up to 5-weeks on one battery charge. Plus, the it has a distortion-free reflection which is pretty amazing considering it has a 5x magnification. Not to mention, every fashionista will love that is has a sunlight simulation light system that allows your flawless look to shine in even the most natural of light. Don’t forget the sensor activated system that allows the mirror to light up automatically just by sensing your presence! If that’s not enough features for you, don’t forget the adjustability which allows you to tilt up and down for maximum comfort no matter if you are sitting or standing. So how do these claims hold up to other consumer reviews? Let’s check it out. With over 400 reviews on Amazon alone, this product still holds strong. The reviewers give this product high marks, especially for its wireless design. Being able to pick it up and move it is certainly worth considering. The cordless feature also allows for a clutter-free space without having to be concerned about where to hide those pesky cords. It also has two height options that allow for flexibility no matter the location. Obviously, the point in the mirror is to be able to see a good reflection. In this area, consumers can’t seem to say enough good things. The LED seems to be on target. It illuminates brightly in a way that actually simulates the sun in order to see every flaw and stray hair. Also, this has 5x magnification which gives you quite the close-up view. But even more impressive, it also claims to have no distortion even around the edges. Wow! Consumers also note a hands-free sensor feature that allows the mirror to turn on and off without having to clear up a hand to do so. It also features a manual on/off switch as well. Although the location of this feature is not the most convenient as it is on the bottom. When compared to other cheaper models, this mirror seems to win hands down. The coloring, lighting, and reflection of some cheaper models didn’t hold a candle to this winner. While this mirror has a slew of positive reviews, it does have a few negative points to consider when making your final decision. Many consumers complained a slight bit about the large size of the mirror. While some seemed to find this a positive aspect to the product, others found it to be a hassle as it wasn’t travel-friendly. The other issue that others have reported is an issue with the sensor not turning on and off at appropriate times which has caused some frustration among some buyers. It was mentioned that it would be nice to have an “on” feature that would keep the mirror on permanently without the use of the sensor so it wouldn’t be such a hassle, particularly in time-consuming situations. So now that we have a summary of consumer’s opinions, is it worth it? It seems to be the go-to mirror for many buyers that didn’t realize what they were missing until they tried this mirror. It may seem like a viable option if you are looking for an excellent make-up mirror to get that flawless skin that is so highly sought after. It might be a deep dip into the wallet, but other buyers seem to think it is well worth the extra dough to have a quality mirror that has excellent lighting, a hands-free sensor feature, no cords, extreme adjustability and a great reflection that puts other mirrors to shame. Maybe a little more budget friendly, the Silver Pick, the Conair Oval Double-Sided Lighted Mirror runs at a list price of $49.99. The price may seem a little more doable, but what features does this price tag have in store for us? This 7”x9.5” double-sided, oval mirror has a 360 degree rotation allowing for either regular viewing or 7x magnification to get ready for any occasion. It also has a 5’ Cord which should allow some freedom to move it where necessary. It also has soft-halo lighting to allow for easy viewing and a great reflection. It still seems to hold it’s own with an overall 4 star review with over 1,400 Amazon reviews. It doesn’t catch that other 0.5 star of the gold pick, but the lower price may be worth it to you. Many buyers agree that this mirror is awesome for its price. The overall consensus is that the mirror has excellent lighting that isn’t too dull or too bright in order to be able to look into it for an extended period of time. The 7x magnification also seems to work so well that some people don’t even want to see the many flaws that it reveals. Many also love the look of the mirror as it appears beautiful and elegant with its oil-bronzed finish, oval shape and classy details. Also, the reviews also claim the mirror is of adjustable height and of a good weight to make it both stable and moveable. It also has a convenient on/off switch located at the base of the mirror. So with all these glowing reviews, it’s hard to believe there would be anything negative to say. But alas, a few critics have pointed out a few negative points to consider when purchasing this mirror. While others brag on the lighting, there are those that claim that it is too dim and not bright enough to see everything as they had hoped. Some like it for the soft lighting while others dislike it for this same reason. The other negative aspect named among the reviews is the lifespan of the mirror’s lighting. Many seemed to think it did not have a long enough life-span for the money, with some claiming as short as only six months to a year. Finally, it has been noted that the mirror can get quite warm to the touch after an extended period of use. So, is the cheaper price worth the few disadvantages this one has in comparison to the gold pick? Does the elegant oval design draw you in? Do you mind having to turn the mirror on and off yourself? These are just a few items to contemplate when considering this Conair pick. 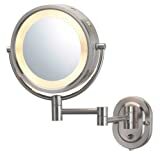 The third place pick is the Jerdon HL65N Lighted Wall Mount Makeup Mirror coming in at a list price of $99. So what notable features contribute to this mirror making it into our top three? The Jerdon is a wall mount style mirror making it rather different from the first two free-standing options. It is moveable to a degree in that it has a 14 inch extension feature. It also has a 360 degree swivel option which allows it to move between a 1x and 5x magnification level. The 8 inch mirror has a sleek and modern style that has landed it in some hotels and spas as well. So what do the buyers have to say about their purchase of this bronze pick? With close to 800 reviews on Amazon, this bronze pick also shines with an overall rating of 4.5 stars! If you are concerned about the installation process, it sounds like your worries may be unfounded as many reviewers claim it is easy to install. Plus, the mirror comes with all the materials needed to make this installation a cinch. Not to mention, the fact that this mirror is mounted onto a wall leaves your countertops free of clutter and available for other necessary items. Many that have had this product for several years claim that overall it has held up very nicely with only a few easy tweaks needed here and there. Not to mention, it should help you rest easy knowing they also offer a 1 year limited warranty. But how about the look and style? Good news, most reviewers give the looks high marks saying that it looks stylish and classy. It seems there is a consensus among buyers that the biggest issue seems to be that the lighting on the mirror is too dim. While some seem satisfied with it, others were rather disappointed saying that the light is not bright enough for their needs. So how will this bronze pick hold up to your standard? Are you excited by the fact that no counter space will be consumed by this wall mounted option or would you prefer one of the free-standing options that have been discussed. The choice is yours! Last, but certainly not least, we have our “cheap” pick for those on a budget, the Decobros Tabletop two-sided swivel vanity mirror. While the Decobros Tabletop Mirror has a pricetag of only $19.87, it boasts an outstanding 5- star overall rating from Amazon with just shy of 300 reviews. Wow! What high marks for this “cheap” pick. So what are the features of this awesome product? What features has these consumers so swooned by this product? The Decobros is also an 8 inch mirror with a 360 degree swivel option. The two sides offer 1x and a 7x magnification options that allow for both far away or close up views. It comes in a nickel finish that offers a touch of elegance and class to your home. Not to mention, this product also comes with a lifetime warranty! So when reading the product’s features, it is important to note that one big difference with this pick versus the other picks is the lack of lighting. This does not have the built-in lighting feature that the other three options have to offer. Now for the very important part, what do the consumers have to say? The reviewers claim that it is distortion free (although a few claim the 7x magnification side is slightly distorted) plus the magnification is very close up to the point of being able to see every hair and flaw and apply makeup with ease. Many buyers were concerned that it would end up looking cheap, but instead, they were pleasantly surprised to find that the mirror looked great. Plus, it seems most are satisfied with the quality as well as it is of good quality and of a sturdy design. It also has so many good reviews that it was difficult to find anything negative to report. The only thing mentioned a few times was that the mirror had some distortion on the 7x magnification side from certain angles. While others did not report this, it is good to note. So this feature probably goes without saying, but the pricing amongst Make-up Mirrors can obviously vary quite a bit. So the first thing you should consider is what is your price range? Are the benefits that the costly ones have to offer worth the extra money? As a quick rundown, the gold pick, simplehuman mirror runs a list price of $199.99. The silver pick, Conair mirror runs a list price of $49.99. The bronze pick, Jerdon mirror runs a list price of $99. And finally, the cheap pick, Decobros mirror runs a list price of $19.87. With that in mind, one sure find the perfect makeup mirror that will fit your particular budget. This feature will certainly make a big difference in the option that you pick. The first 3 picks that we looked at were lit mirrors, meaning they came with their own built-in lighting source. However, the “cheap” pick did not have it’s own lighting source. The advantage of a lighted mirror is that it can provide extra lighting in a dim-lit room. Plus, it can also help to provide an even flow of lighting without having the effects of shadows while trying to apply makeup. In other words, it can help in the process of trying to provide that even, flawless look. It may help to consider the room in which you plan to use this mirror. Is it brightly lit? How bright of a light will you need? Is there a natural source of lighting in this room? Which mirror would provide the best, most natural lighting for me? These are all valid questions to ask when deciding if you need a mirror with its own lighting source or not. Since applying makeup, tweezing hairs, and finding flaws is a tedious task, the magnification level is a very important feature of a makeup mirror. When considering this feature, it may be good to ask yourself some of these questions. Is magnification that important to you or do you just need to be able to see a good overall reflection? How much magnification do you need for your vision needs? The higher magnification levels can especially help those that have vision impairments as it may ease the difficulty of putting on makeup without corrective lenses. Do you want one or two different types of magnification levels? Several of the options that were discussed allow for two different magnification levels depending on which side you are viewing at the time. One benefit of the two-sided magnification levels is that you can see a close up view on one side while getting the far-away, big picture view on the other side. Is distortion ok or do you need it to be free of distortion? Some users mentioned distortion in the mirrors particularly those with the higher magnification levels. Just as a quick review, the first, simplehuman pick had only 1 side with a 5x magnification level. The second, Conair pick, had two-sides. One side had regular viewing while the other side had a 7x magnification level.The third, Jerdon pick also had two-sides. One side had a 1x magnification level while the other side had a 5x magnification level. The fourth, Decobros pick had two-sides as well. One side had a 1x magnification level while the other side had a 7x magnification level. With the four options that have been considered, there were various types of stationary versus moveable mirror options. It is an important feature to consider especially if you will be using it in multiple areas. With the first option, the simplehuman gold choice, it offered a cordless option that allowed the mirror to be easily moved from space to space without having to mess with any pesky cords. This cordless feature makes it one of the most moveable options that have been discussed. The second pick, the Conair silver choice, is moveable to an extent but it does have a cord. However, the cord is 5’ in length allowing for some flexibility in location. The third pick, the Jerdon bronze choice, is mounted to the wall. While it does have an extendable arm, it is much more stationary than the others as it is limited to one room. The fourth and final choice, the “cheap” Decobros option, is also cordless and easily moveable as it has no lighting feature and therefore requires no cord. In conclusion, I hope that this article has helped you in your decision process of which makeup mirror is best for you and your needs. It provided quite a few options for every style, budget and magnification level needed. I think it is safe to say, that no matter which of these highly-rated mirrors that you choose, you are bound to find a gem in any of them. 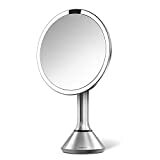 So whether you decide to go with the $199.99 gold choice, simplehuman mirror or the $19.87 “cheap”, Decrobros pick, I hope it suits your every “mirror need” from finding the tiniest of flaws to getting that glowing, flawless look you have always wanted.